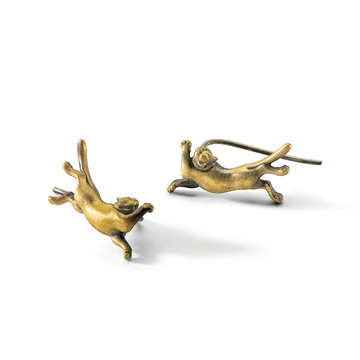 Leo season started last Sunday, and I’ve got the lion jewelry of your dreams. My Eleanor lion necklace. Click to purchase. That said, big cats aren’t always better! 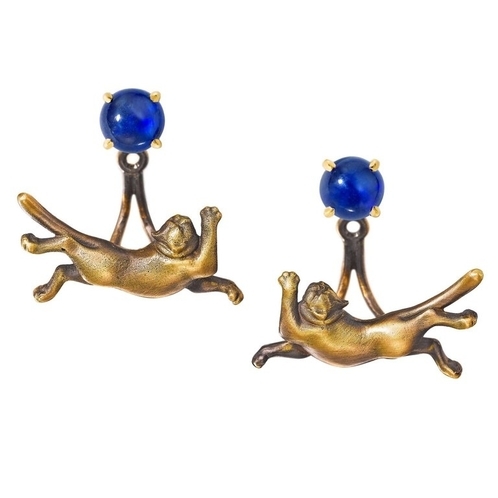 Why not do something different and get some small-cat jewelry for a feline-loving Leo’s birthday? 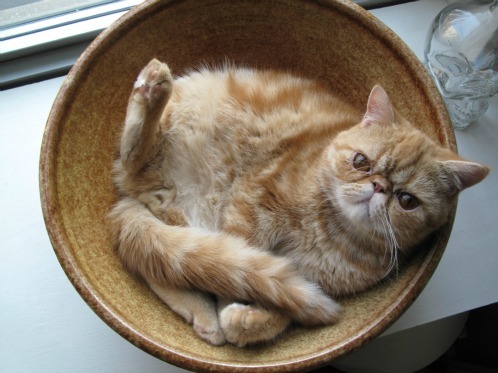 I’ve got designs inspired by my own beloved FitzRoy the cat on 1stdibs. 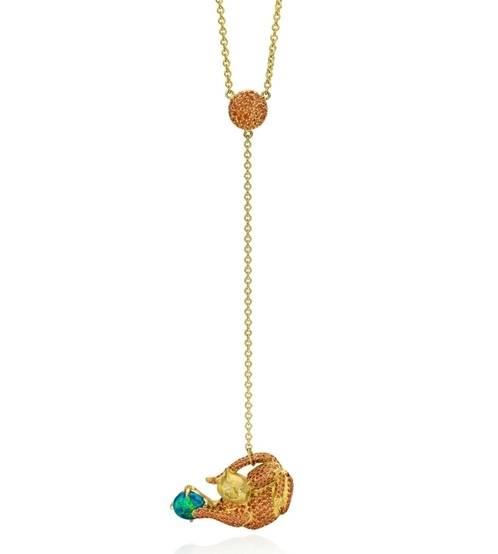 Fitzy is Instagram-famous for sitting in a large orange bowl, and I created a one-of-a-kind 18K gold lariat necklace set with orange sapphires in honor of some of his iconic bowl poses. Click for closeups on 1stdibs. Fitzy’s “toy” is a nearly one-carat Australian black opal. Click to purchase on 1stdibs. … that my gorgeous friend Alyssa modeled for me. 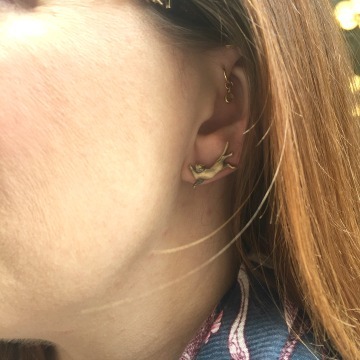 Finally, there are cat earring jackets that you can buy with my birthstone studs, but also wear with other stud earrings you already own. Shown with sapphires, but any birthstone is available. Make the crazy cat lady in your life happy — especially if you ARE the crazy cat lady in your life — with cat jewelry worth wearing for all nine lives! Separately, here’s what was on the blog this week. Monday, July 23: I celebrated my 11th blogversary. Tuesday, July 24: Speaking of 1stdibs — as I was above — I did an interview with them about antique inspirations. Wednesday, July 25: Lost an important piece of jewelry? I feel your pain in this week’s YouTube video, having lost my wedding band right in time for my 17th wedding anniversary. Thursday, July 26: Spacenook has been in the news, so I took a look back at the doubts I expressed about Mark Zuckerberg in 2010. Friday, July 27: Lots of anniversaries this week! Madonna’s first album came out 35 years ago today. Don’t forget to follow me on Instagram and YouTube! FitzRoy the cat is on Instagram too, along with his younger brother Purrkoy. Damn! Coco Has a Pair of Big Ones!